The classical “low latitude–high defense” hypothesis is seldom supported by empirical evidence. In this context, we tested latitudinal patterns in the leaf defense traits of deciduous broadleaved (DB) and evergreen broadleaved (EGB) tree species, which are expected to affect herbivore diversity. We examined the co-occurrence of leaf defense traits (tannin and phenol content, leaf mechanical strength, leaf dry matter content, leaf mass per area, and leaf thickness) in 741 broadleaved tree species and their correlations with species geographical range in East Asian island flora. We discovered contrasting latitudinal defense strategy gradients in DB and EGB tree species. DB species employed chemical defenses (increasing tannin and phenol content) at higher latitudes and physical defenses (softer and thinner leaves) at lower latitudes, whereas EGB tree species exhibited opposite latitudinal defense patterns. The “low latitude high defense” hypothesis included a paradoxical aspect in chemical and physical defense traits across broadleaved tree species. To reconcile paradoxical defense strategies along the latitudinal gradient, we conclude that interactive correlations among leaf traits are controlled by leaf longevity, which differs between DB and EGB tree species. The feeding ecology of Great Cormorants (Phalacrocorax carbo) during the breeding season in the Kano River basin, central Japan, was examined to clarify the trophic relationship between the cormorants and ayu (Plecoglossus altivelis altivelis) reared for mass release in the river. The ayu was most frequently found in stomachs of cormorants culled during the breeding season, despite relatively poor catch in the year-round fish fauna research in the watershed. Carbon and nitrogen stable isotope ratios of some ayu individuals extracted from the stomachs of the culled cormorants were similar to the isotopic values of ayu caught in the watershed, whereas the other stomach-content ayu showed peculiarly high nitrogen isotopic values, clearly distinct from the values of the ayu caught in the watershed, and overlapped with the values of mass-release ayu. Furthermore, isotopic values of past diets inferred by the isotope analysis of livers of the culled cormorants were closer to the values of the mass-release ayu, relative to the past diet values inferred by the analysis of the cormorant muscles. This suggests that the food supply from the mass-release ayu had increased in the breeding season, since the isotopic turnover rate is faster in livers than in muscles. The huge number of formula-fed ayu released in the watershed create an anthropogenic food chain which is assumed to significantly support the breeding of the cormorants. The reverse seasonal flooding that resulted from the construction of the Three Gorges Project has induced a drastic degradation of draw-down zone vegetation and the seed bank in the reservoir. The composition and distribution of seed banks and their similarities to standing vegetation were determined through field investigations and germination experiments on the vegetation as well as soil seed bank data collected from three restoration sites in Zigui county, Wanzhou city, and Zhongxian county to uncover the effects of vegetation restoration on seed bank development in the Three Gorges Reservoir region. The results showed the soil seed banks were composed of 44, 43, and 50 herbaceous species, and an average seed density of 9418.79 ± 804.92, 4283.44 ± 427.89, 6539.28 ± 432.22 seeds/m2, respectively. The soil seed bank was mainly composed of annual and perennial herbaceous plants. Most of the dominant species of soil seed banks came from introduced species. Reverse seasonal flooding induced the spatial variation of species diversity and seed density of the soil seed bank. The species diversity in the upper part of the draw-down zone was higher than that in the middle and lower parts. The highest seed density occurred in the middle upper parts of the draw-down zone, followed by the lower part. The similarity coefficient between the soil seed bank and the extant vegetation community was 0.495, 0.526, and 0.550 at Zigui, Wanzhou, and Zhongxian restoration sites, respectively. Patchy habitats often enhance species coexistence and, consequently, abundance of each species. The present study examined two indicators of potential habitats for anemonefish Amphiprion frenatus: total area of dark-colored patch reefs that are detectable on an aerial image with image analysis software, and total area of tall patch reefs (< 1.5 m in height) that are detectable on stereoscopic aerial images with a stereoscope. Relationships between patch reef area and anemonefish abundance, as estimated by number of host anemone Entacmaea quadricolor, were investigated at Shiraho Reef, Ishigaki Island, Japan. Total number of anemones was not correlated with total area of tall patch reefs but was highly correlated with total area of dark-colored patch reefs. Underwater observations confirmed that upper surface of tall patch reefs often involved bare substratum, whereas dark-colored patch reefs did not include this substratum. Because reef area approximately reflected reef volume within shallow back reefs, total area of dark-colored patch reefs that are detectable by aerial photography will reflect total volume of reef fish habitat. The present study suggests that aerial photography with a drone can provide a useful predictor of reef fish abundance. The primary objective of this paper was to estimate how the mass of Silver fir (Abies alba Mill.) and Scots pine (Pinus sylvestris L.) deadwood in two decay classes affected biochemical processes and the accumulation of soil organic matter, as well as the extent of this impact. We evaluated deadwood mass, as well as the biological activity and influence of the distance from deadwood on biological activity and carbon (C) storage. The investigation was carried out in Magurski National Park, southern Poland, in four randomly selected study plots. The organic C and nitrogen contents and soil pH and texture were analysed. The study also included the determination of enzyme activities. The results obtained demonstrated that soil C storage and the biological activity of the soil were influenced by deadwood form, tree species and decay class. Significant differences in the C content in the soil between the logs of fir and pine trees were noted. With the advancement of the deadwood decomposition process, the C concentration and enzyme activity increased slightly. Lower C accumulation occurred further away from the deadwood. At a 100-cm distance from the deadwood, the influence of the logs was not evident. Higher C storage was found in the soil around the stumps than in the decaying logs. This study confirmed an important role of deadwood in forest ecosystems, i.e., maintaining species biodiversity and increasing C accumulation in the soil environment with a simultaneous increase in the biological activity of the soil. Proportions of specialist and generalist primary parasitoids have been described by the resource breadth and the trade-off hypothesis. 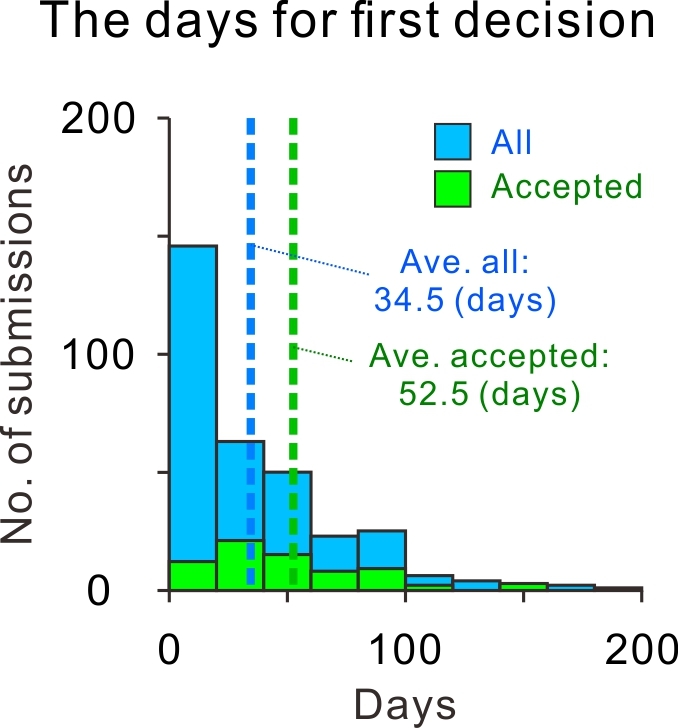 These alternative hypotheses predict either decreased or increased, respectively, parasitism rate of shared aphid species by specialist parasitoids. We tested both hypotheses and the confounding effects of landscape structure and agricultural intensification (AI) using extensive samplings of aphids and their parasitoids in Polish agricultural landscapes. Abundances, species composition of aphids, primary parasitoids, and parasitism rate of aphids by specialists and generalist parasitoids were analysed. Contrary to our expectations we found equally decreased parasitism rates by both types of primary parasitoids at higher aphid densities and thus proportion of specialists to generalists did not change with increasing host density. In line with the resource breadth hypothesis, specialist parasitoids had always lower abundances and parasitism rates than generalist parasitoids. Landscape diversity and agricultural intensification did not influence the host-parasitoid population dynamics. We speculate that these contrasting results could be caused by the additional density effects of secondary parasitoids. We conclude that simplistic two-trophic-level population models are not able to fully describe the complex dynamics of trophic networks. We also argue that agricultural intensification has lower effects on abundance and effectiveness of parasitoids than predicted by respective predator-prey models and empirical studies performed in controlled and artificial conditions. 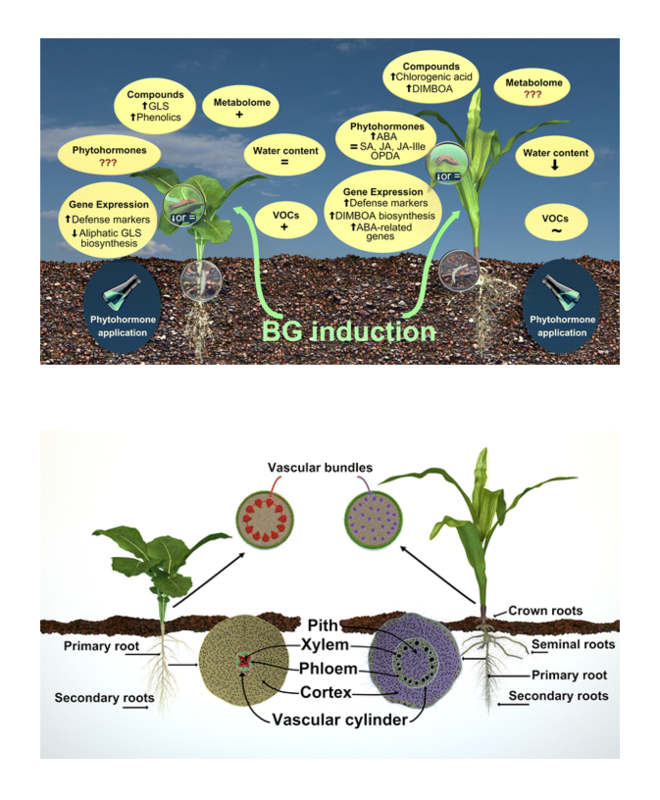 Plant-mediated interactions between belowground (BG) and aboveground (AG) herbivores have received increasing interest recently. However, the molecular mechanisms underlying ecological consequences of BG-AG interactions are not fully clear yet. Herbivore-induced plant defenses are complex and comprise phytohormonal signaling, gene expression and production of defensive compounds (defined here as response levels), each with their own temporal dynamics. Jointly they shape the response that will be expressed. However, because different induction methods are used in different plant-herbivore systems, and only one or two response levels are measured in each study, our ability to construct a general framework for BG-AG interactions remains limited. Here we aim to link the mechanisms to the ecological consequences of plant-mediated interactions between BG and AG insect herbivores. We first outline the molecular mechanisms of herbivore-induced responses involved in BG-AG interactions. Then we synthesize the literature on BG-AG interactions in two well-studied plant-herbivore systems, Brassica spp. and Zea mays, to identify general patterns and specific differences. Based on this comprehensive review, we conclude that phytohormones can only partially mimic induction by real herbivores. BG herbivory induces resistance to AG herbivores in both systems, but only in maize this involves drought stress responses. This may be due to morphological and physiological differences between monocotyledonous (maize) and dicotyledonous (Brassica) species, and differences in the feeding strategies of the herbivores used. Therefore, we strongly recommend that future studies explicitly account for these basic differences in plant morphology and include additional herbivores while investigating all response levels involved in BG-AG interactions. The world's freshwater molluscan fauna is facing unprecedented threats from habitat loss and degradation. Declines in native populations are mostly attributed to the human impact, which results in reduced water quality. 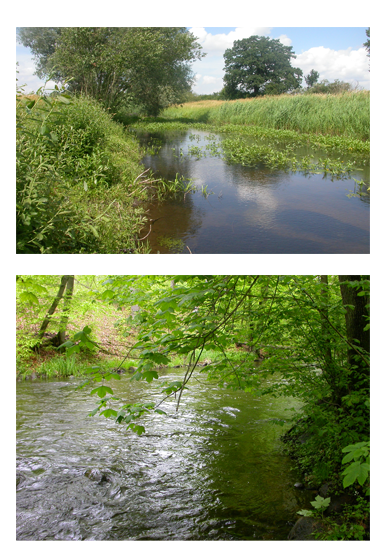 The objectives of our survey were to analyse the structure of the mollusc communities in a medium-sized lowland river and to determine the most important environmental variables at different spatial scales, including landscape structure, catchment land use and instream environmental factors that influence their structure. Our survey showed that a medium-sized river, that flows through areas included in the European Ecological Natura 2000 Network Programme of protected sites, provides diverse instream habitats and niches that support 47 mollusc species including Unio crassus, a bivalve of Community interest, whose conservation requires the designation of a special conservation area under the Habitats Directive Natura 2000. This survey showed that mollusc communities are impacted by several environmental variables that act together at multiple scales. The landscape structure within buffer zones, catchment land use and instream environmental variables were all important and influenced the structure of mollusc communities. Therefore, they should all be taken into consideration in the future restoration of the river, future management projects and programmes for the conservation of biodiversity in running waters. 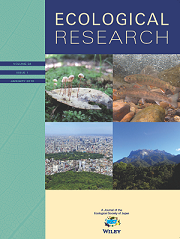 The results of this study may be directly applicable for the rehabilitation of river ecosystems and are recommended to stakeholders in their future decision concerning landscape planning, monitoring species and their habitats, conservation plans and management in accordance with the requirements of sustainable development. 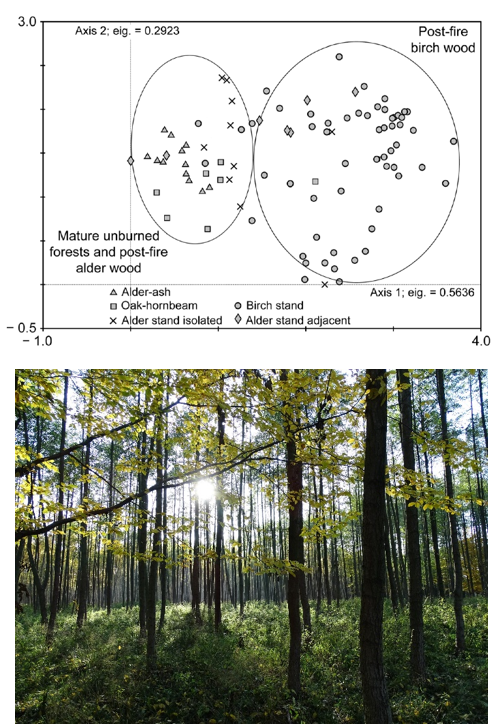 We investigated the effects of several tree species on dehydrogenase and urease activities in soils derived from two different parent materials (glaciofluvial sand and loess) in forested areas in southern Poland. We hypothesized that coniferous forests (pine, spruce) alter the soil cation exchange capacity (CEC) and decrease soil pH and, therefore, might decrease soil enzyme activities compared with broadleaf species growing on similar soils. Eight paired plots (12 × 12 m) were established on glaciofluvial sand in pine (Pinus sylvestris) + oak (Quercus robur) and spruce (Picea abies) + pine stands, as well as on loess-derived soils: beech (Fagus sylvatica) + pine and hornbeam (Carpinus betulus) + pine stands. Each plot was a 4 × 4 m grid with 16 sampling points. In soil samples pH, soil texture, and organic carbon, nitrogen, base cation contents, dehydrogenase and urease activities were determined. On both parent materials, the soil pH was lower under coniferous species than under broadleaf species. The acidifying effect of tree species on sandy soil was in the order of spruce = pine > oak, while that on loess was pine > beech > hornbeam. Hornbeam and oak increased the soil pH and stimulated enzyme activity in the soil. The content of fine fraction enhanced potential enzyme activities in soils, thus the loess soils had greater dehydrogenase and urease activity. The results suggest that pine stores more soil organic C in association with silt increasing the pool of stabilized soil organic C.
Mountain forest soils contain an important stock of carbon. Their altitudinal gradient can serve as a model for research on the potential risk of increased emission of carbon dioxide to the atmosphere, in a positive feedback of global warming. Using soil samples collected at three elevations (600, 900, and 1200 m a.s.l.) from five separate slopes of the Carpathian Mountains (Poland), we studied the effects of soil physical, chemical and microbial properties controlling the temperature sensitivity (Q10 values) of organic matter decomposition in forest soils. Data of soil basal respiration rate measured in laboratory conditions at six different temperatures (5, 10, 15, 20, 25 and 30°C) were fitted to a Gaussian function. The modelled soil respiration rates differed between altitudes at temperature exceeding 15 °C, and the respiration rate of soil from 1200 m a.s.l. was higher than in soils from the two lower elevations. Based on the modelled respiration values, we calculated Q10 values in the low (Q10L, 0–10°C), medium (Q10M, 10–20°C) and high (Q10H, 20–30°C) temperature ranges. The Q10 values did not differ between elevations. Q10L and Q10M were negatively related only with the C:N ratio. Temperature sensitivity of decomposition of soil organic matter was not affected by bacterial activity and functional diversity (assessed using BiologR ECO plates), microbial biomass or community structure (inferred from phospholipid fatty acid assays). Our findings support a kinetics-based theory of the higher temperature sensitivity of more chemically recalcitrant soil organic matter, put forward by other authors. The application of advanced technologies to the study of little-known species is a necessary step in generating effective conservation strategies. Despite the biological importance of the small carnivore guild, a paucity of data exists in terms of the spatial ecology of these species, largely due to logistical constraints of large and bulky collar units. This study reports the first known satellite collaring of a viverrid, the Malay civet (Viverra tangalunga), in Sabah, Malaysian Borneo. Stationary tests of two generations of 65–70 g e-obs GmbH 'Collar 1A' units recorded high fix success rates and good accuracy and precision under semi-open canopy. From October 2013–August 2015, nine adult V. tangalunga were fit with e-obs collars recording hourly nocturnal GPS locations. Collars were successfully deployed for 27–187 days. Field GPS fix success varied from 22 to 88.3 %, with the study documenting a total GPS success of 58.1 % across all individuals. Despite this large in-field performance range, the quality and quantity of data collected by these units surpass that of previous VHF studies on Asian viverrids, collecting on average a 16-fold increase in locations per collaring day. The successful application of satellite technology to these little-known carnivores carries significant biological and conservation implications, and it is recommended that satellite collars are a viable technology to conduct detailed and well-designed ecological studies of Viverridae species. The studies, which were conducted in southern Poland, focused on the recovery of the herb layer in 17-year-old post-fire silver birch and black alder forests. Although both types of stands, which are of the same age, developed spontaneously, the alder stands occupied damper sites (with thicker A horizons that survived the fire) than those in the birch forests. We surveyed the migration rates of 44 woodland species, primarily ancient woodland indicators, into both forests and the potential differences in these rates depending on their moisture regime and the community type represented by unburned forests, which were treated as the source of the woodland species pool. Additionally, the role of local depressions with high humidity that were covered by post-fire alder woods in the colonization process, as well as species survivorship and recolonisation, were estimated. Woodland species showed diverse migration paces among the sites; most of them migrated faster on more fertile sites with a higher humidity. Small patches of post-fire alder woods contributed to the recolonisation process since many woodland species in the herb layer survived the fire due to its high humidity, which inhibited the intensity of the forest fire. The recovery of woodland species in post-fire woods is the combined effect of regeneration, which relies on autochthonic propagules, and secondary succession, which is based on allochthonic propagules. Local depressions, which provide refuges for fire-sensitive, dispersal-limited species, contribute to their survivorship and thus to the successive recovery of herbaceous layers after a fire. Bark beetles infest several pine tree species, often creating major economic losses. Biotic interactions between Scolytinae populations inhabiting Pinus sylvestris were analyzed using a new sampling method involving a two dimensional division of tree space resources into units and sections. The goal was to evaluate the effects of the type of available reproduction material on insect infestation. The P. sylvestris stands in this study included an analysis of bark beetles colonizing dead trees and uninfested living trees (trap trees). 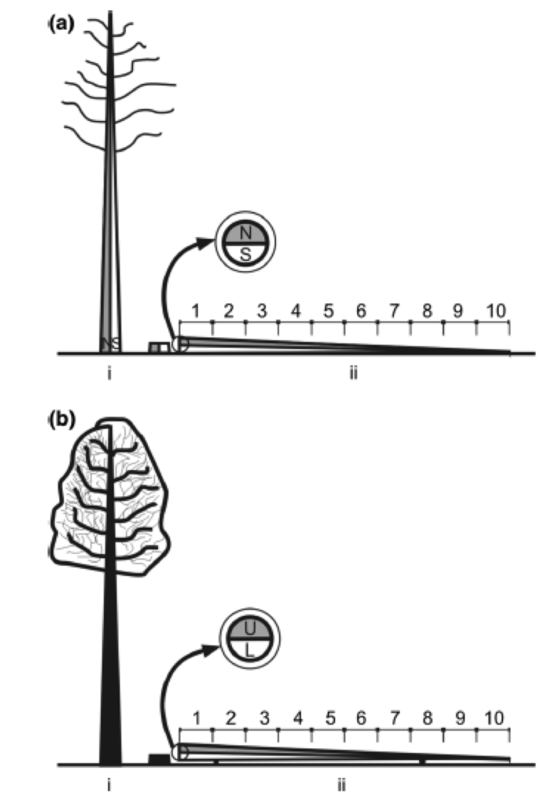 Analyzed trees were harvested and their stems divided into ten equal units; each unit was halved into two sections (half of the stem circumference). The colonization of dead trees by insects was evaluated immediately after cutting for infested trees and 2 months after cutting for trap trees. The type of breeding material significantly affected the species composition of bark beetles infesting P. sylvestris. The dead trees were colonized mostly by Trypodendron lineatum and Tomicus minor, and to a lesser extent by Tomicus piniperda, which dominated in trap trees. Tomicus piniperda and T. lineatum preferred thicker stems; however, T. minor, Hylurgops palliatus and Pityogenes bidentatus preferred thinner ones. The application of the new sampling method helped to increase the accuracy of niche segregation among insect species. The results of niche segregation indicate bark beetles exhibited spatial specialization in the use of resources, mainly related to the moisture content of breeding material and the availability of food resources which is the main factor determining the coexistence of bark beetles in the same environment. The successful establishment of vegetation, soil development and biogeochemical cycling during the restoration process of mine tailings requires a diverse and metabolically active microbial communities. The objective of this study was to test whether there is any link between the functional groups of both the dominant plant species and soil microbial communities on unreclaimed coal mine spoil heaps of different age located in the Silesian Upland (Poland). At each sampling site the dominant plant species were recorded and characterised based on their Raunkiaer’s life form, socio-ecological group and their potential to form mycorrhiza. The functional diversity of the plant-associated microbial communities was assessed using the microbial carbon-utilisation guilds generated using the Biolog method. We observed no differences in the microbial functional diversity, but a gradual increase in the plant functional diversity with the age of the heap. Our results indicate that trees, plants with the potential to form ectomycorrhiza, and deciduous plants strongly affected the carbon-utilisation profiles. The mean proportion of microbe guilds in dominant plant patches accounts for 60 % of the variance while the soil physicochemical parameters explained only 30 % of the variance. This suggest that in post-industrial habitats the biotic features of the soil substratum are more important for the vegetation development than the abiotic parameters. Complex species distribution models of Goldcrests and Firecrests densities in Poland: are remote sensing-based predictors sufficient? Piekarska-Stachowiak A., Szary M., Ziemer B, Besenyei L, Wo&zacute;niak G.
Heydel F., Cunze S., Bernhardt-Romermann M. & Tackenberg O.
Liu, Y., Liu, S., Wang, J., Zhu, X., Zhang, Y. & Liu, X.
Wang, X-L., Guo, X-L., Hou, X-G., Zhao, W., Xu, G-W. & Li, Z-Q. Koiodziej-Sobocinska, X., Zalewski, A. & Kowalczyk, R.
Kurek, P., Kapusta, P. & Holeksa, J.
Kosicki, J. Z., Chylarecki, P. & Zduniak, P.
Factors affecting Common Quail's Coturnix coturnix occurrence in farmland of Poland: is agriculture intensity important? Nakamura, M., Hirata, R., Oishi, K., Arakaki, T., Takamatsu, N., Hata, K. & Sone, K.
Chmara, R., Szmeja, J. & Ulrich, W.
Myczko, L., Rosin, Z. M., Skorka, P., Wylegaia, P., Tobolka, M., Fliszkiewicz, M., Mizera, T. & Tryjanowski, P.
Bezemer, T. M. & Jones, T. H.
Kosicki, J. Z. & Chylarecki, P.
Chikaraishi, Y., Ogawa, N. O., Doi, H. & Ohkouchi, N.